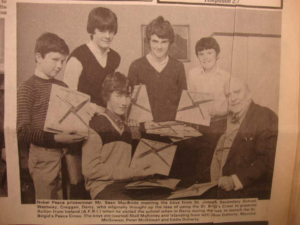 Inspired by the generosity of five young boys from his hometown neighbourhood, who made and sold St. Brigid’s Crosses to support his work with AFrI, Mullan developed with them the St. Brigid’s Peace Cross Campaign. The five boys were brothers Eddie and James Doherty, Peter and Maurice McGowan and their friend Neil Mahony. The Nobel and Lenin Peace Prize winner, Sean MacBride SC, travelled to Derry to launch the initiative in 1993. 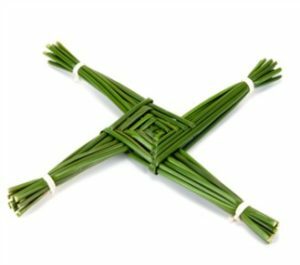 Taking the ancient tradition of making St. Brigid’s Crosses on 1 February, the first day of Spring in Ireland, Mullan helped AFrI reinterpret much of its ancient symbolism in a 20th Century context. Of primary interest was the discovery of the story of Brigid giving away her father’s sword to a poor man. Mullan saw in this story a Celtic parable of disarmament and development. His research also lead him to the site of St. Brigid’s Fire Temple in Kildare Town, which had burned perpetually for over 2000 years before it was extinguished during the Reformation. Only women could be keepers of the fire. Mullan became determined to help rekindle the ancient flame. 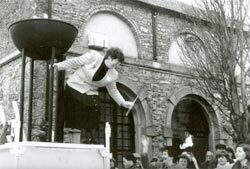 Brigid’s Fire and the annual Feile Bride Festival, Kildare (1993), and greater involvement by the Brigidine Sisters in Justice and Peace initiatives, including the establishment of Solas Bhride Centre and Hermitages. Mullan developed a strong relationship with the Irish Brigidine Sisters and invited Sr. Eileen Deegan onto the AFrI Executive Committee, a role she fulfilled for several years. Working with Mullan, Youghal Carpets, Cork, designed a hand-woven carpet depicting St. Brigid giving away her father’s sword to the mendicant. Two carpets, containing over 100,000 individual woolen pieces, were made by Irish school children and presented to the peoples of the USA and the former USSR.